A FAMU-FSU College of Engineering research team is taking a hard look at car crashes involving drivers 65 and older to see if infrastructure changes could be made to keep that population safer. 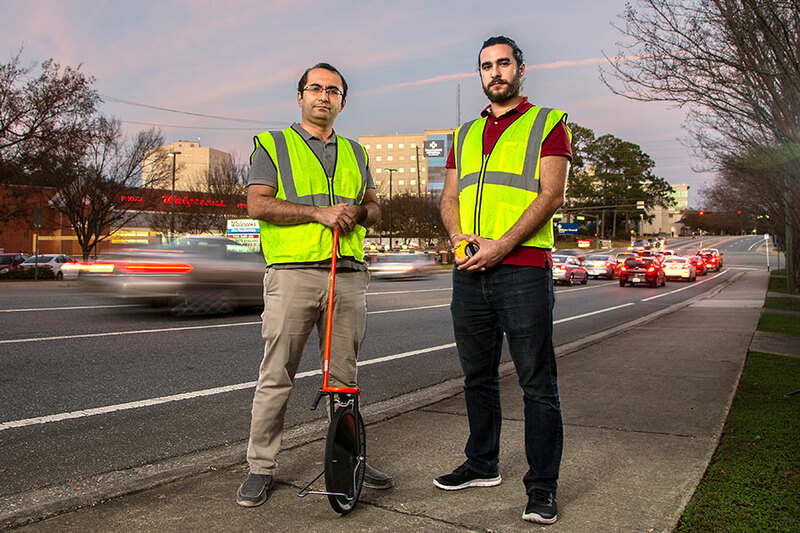 Assistant Professor of Civil Engineering Eren Ozguven and graduate student Mehmet Baran Ulak published a new study in the journal Accident Analysis and Prevention that uses metrics to analyze the location of crashes, the time they occur and how this relates to the crash occurrence. The study resulted in some interesting revelations including how location is related to senior driver crash rates. Researchers learned that the presence of facilities such as hospitals, places of worship or supermarkets makes a location more likely to have crashes occur in this population group. This suggested that roadways around these facilities should be especially scrutinized by infrastructure planners and road safety stakeholders. Ozguven and Ulak recommended that roadways near these facilities — especially roadways close to aging communities — need to be identified and safety measures for drivers and pedestrians in these areas should be enhanced. The research also suggested that crashes for senior drivers were more likely to occur on a weekday and that about 3 p.m. appeared to be a critical time for these drivers. Traffic safety measures taken for this population need to take into account time of day and day of week as well as amenities available in the immediate area, researchers noted. “This timing aspect clearly indicates that older drivers have a tendency to go out and handle their daily chores differently than other age group drivers,” Ozguven said. Crashes involving people 65 and over have increased at an alarming rate over the last few years, according to the National Highway Traffic Safety Administration (NHTSA). Seniors are generally safer drivers compared to other age groups. Due to physical and cognitive health issues, however, they are more like to be injured or die from injuries sustained in a crash. Florida has one of the largest population of senior drivers and has one of the highest rates in the nation of crash-related deaths of people over the age of 65. Other authors on this paper include FAMU-FSU Engineering Associate Professor of Industrial Engineering Omer Arda Vanli, Assistant Professor of Civil Engineering Maxim A. Dulebenets and Professor of Civil Engineering Lisa Spainhour. The work for this study was supported by a U.S. Department of Transportation grant and was administered by the Center for Accessibility and Safety for an Aging Population (ASAP) at the FAMU-FSU College of Engineering and the University of North Florida.